This holiday decoration idea was inspired by the many shaped cookie cutters, candy molds, and shaped cupcake tins that can be acquired in various craft stores and cooking stores. 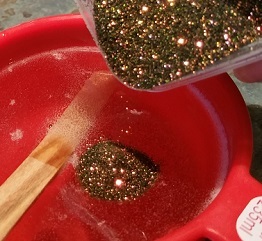 This is a wonderful indoor glitter craft project for kids and adults. These sparkly soaps are perfect for a guest bathroom, in the kitchen, or any sink as an alternative for an ordinary bar of soap. 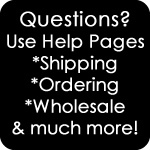 Raw or Scented Glycerin Soap (which you can find at most craft stores in both clear and white. 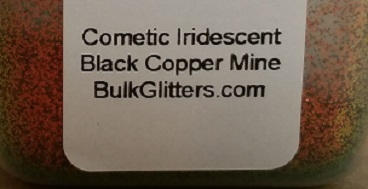 We recommend clear as the glitter sparkles more). 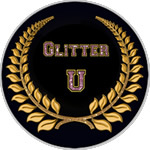 Ultra Fine Polyester Glitter (cosmetic grade is recommended). 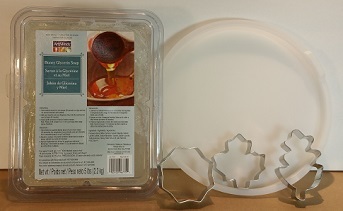 A shaped mold; I used a shallow flat bottom flexible plastic lid and cookie cutters. 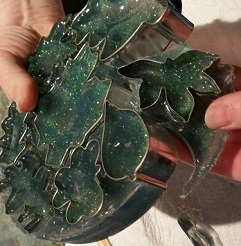 If you use a hard tin or aluminum mold you will want to add a little oil to the mold so the soap will pop out of the mold after it solidifies. 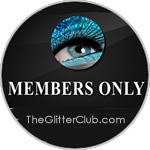 Optional items that can be used are food coloring (it seems to help suspend the glitter a bit), scents, or even small gems or very small toys (to add a Seek And Find mode to the soap). Raw glycerin soap comes in bricks or tubs. 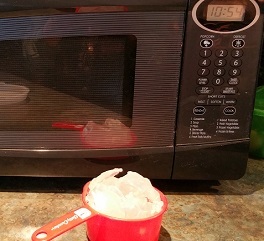 You will need to cut or spoon out the soap into a microwaveable bowl. I like to use a plastic measuring cup so I can keep track of how much soap I have melted. 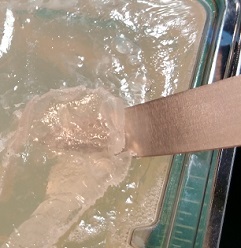 To melt the raw soap, place the microwave safe measuring cup filled with the glycerin soap into the microwave for 30 seconds on high. Make sure to watch the soap melt, so as not to burn the soap. 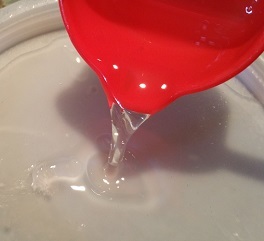 Stir the soap after it is melted to make sure it is completely liquid. 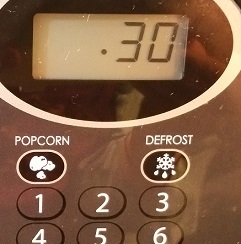 Heat a bit more if necessary (time varies based on the quantity you are melting). 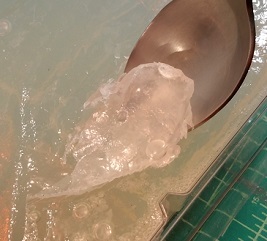 It took one minute on high to melt a one cup measure of glycerin soap. 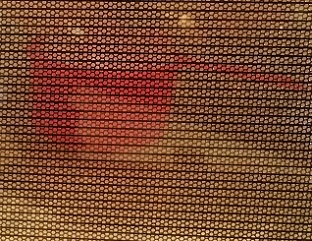 It took one minute and thirty seconds to melt one and a half cups. 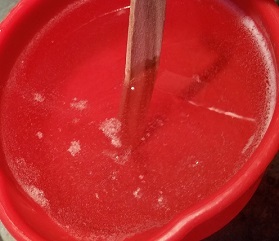 If you choose to melt the glycerin soap on the stove top, make sure to use a nonstick pan, and have your heat or flame on a low to medium setting. You may find it will take longer or shorter to turn your raw glycerin soap to liquid depending on your microwave, what altitude you live at, and the type of raw glycerin soap you have purchased. 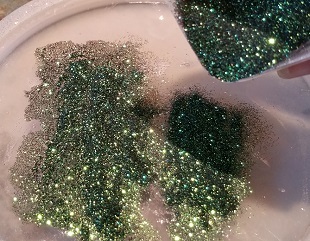 There are two ways to add your cosmetic polyester glitter to the melted glycerin soap. 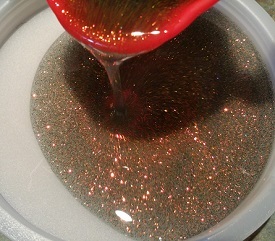 You can pour the glitter into the melted soap and stir in the glitter. 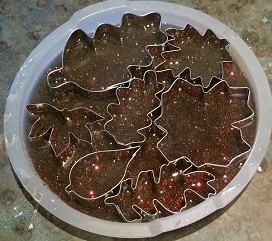 Then pour the glitter soap into your container and place your cookie cutters into the soap-glitter mixture. 2. 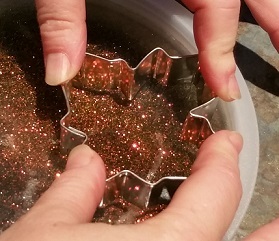 You can pour the melted soap into your container, add your cosmetic polyester glitter, stir the mixture, then place your cookie cutters. 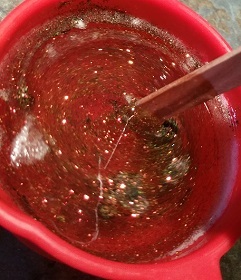 Optional: If you are adding soap coloring to your soap only use one to three drops, so that you are still able to see your glitter through the dye. You can also add the soap coloring into the poured liquid glitter soap and use a toothpick or a popsicle stick to stir the dye around. 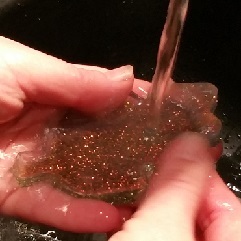 Make sure that you can still see through to the bottom of the soap (you want to be able to see that glitter sparkle!). 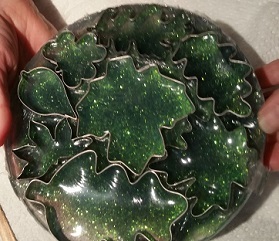 Depending on the size of your container and the size of your cookie cutters, you may be able to get several soaps made at once. 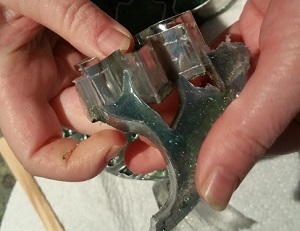 The plastic lid that I placed my liquid glitter soap and cookie cutters into measured six inches across and an inch deep. 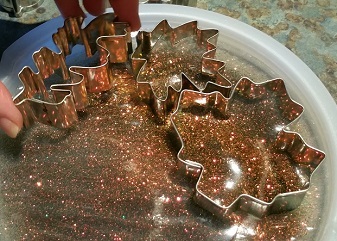 I poured the melted glitter soap into the plastic lid, then placed the cookie cutters into the melted mixture. 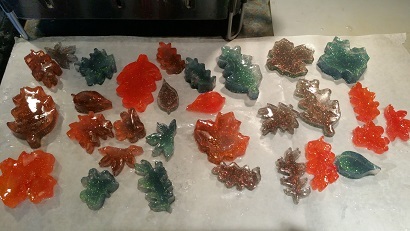 The finished soaps were 1/2 an inch to 3/4 of an inch in height. I made several batches testing out different colors and depth of soap. 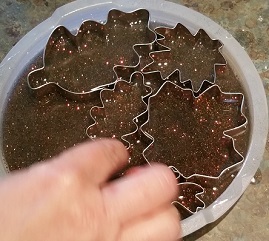 Once all of your cookie cutter shapes are placed into the melted glitter soap, place the plate/cookie sheet/mold into the refrigerator to cool and solidify the soap. 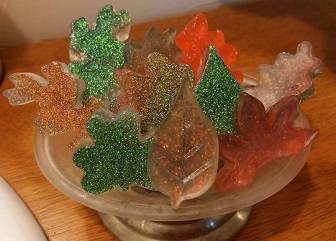 The faster the glitter soap cools the less the glitter will settle to the bottom of the soap shape. In the refrigerator, the soap solidified in about 10-15 minutes. If you place your mold into the freezer it will take less time to harden, though you will want to make sure it does not freeze. 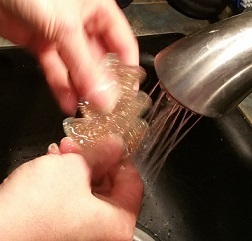 When the liquid glitter soap has solidified, you can peel and push your soap out of the molds. Once the soap has been taken out of the molds you may find that a quick wash softens sides and gets rid of any dull finish that refrigerating may have caused. You can also rub the edges with your hands and fingers. 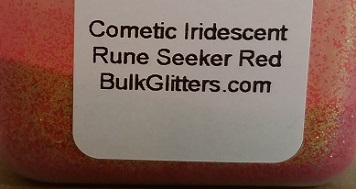 Optional: You may find that the glitter has settled a little, leaving you with a wonderfully super sparkly side and another side that is not as sparkly. 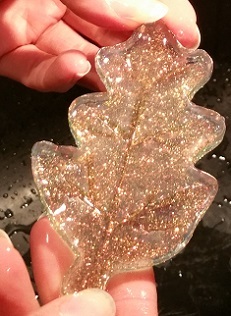 You can use leather or play-dough carving instruments to add veins to the soap leaves. Make sure to rinse the leaves after you have completed your carving as carved section will show up better after it is rinsed off. 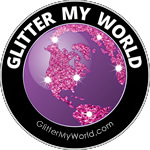 Try a variety of glitter colors and food colorings. 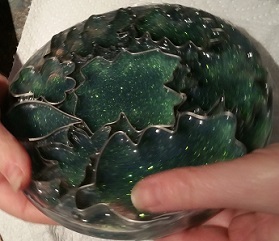 You can swirl in the different colors to add a mottled effect or use one color to have a solid looking leaf.